Monday's fiery oil train crash in West Virginia was the latest in a string of explosive wrecks that have sparked fears about America's surge in oil train traffic. And soon those trains may be rumbling through populated areas with just a single person at the controls, a change that railroad workers say presents an unacceptable risk. Railroads have proposed eliminating the job of on-board conductor on most trains, leaving just an engineer aboard. The workers argue that one-person crews will mean more out-of-control trains, like the runaway that caused the Lac-Mégantic disaster in 2013. An oil train rolled downhill in the tiny Quebec town and exploded, killing 47 people. The company that owned the train had just downsized to a one-man crew, and that engineer failed to set the brakes properly, according to regulators. Railroad executives counter that a new GPS-based braking system—required by Congress by the end of this year—will be enough to blunt that risk. But railroad workers, environmental groups, and people in the communities along the tracks strongly disagree. "It's a recipe for disaster," said Mark Voelker, a switchman for BNSF Railway and an organizer for the SMART union, which represents conductors nationwide. "These are mile-long trains carrying every kind of hazardous material you can think of through communities," said Jen Wallis, another BNSF employee and founder of a caucus with members from 13 different railroad unions. "Why would you compromise the safe passage of these trains for profit?" In January, regulators at the Federal Railroad Administration proposed a rule that would make two-man crews mandatory. The administration has not yet signed off on the rule, however, and the industry is resisting. In public and behind the scenes, the railroads have lobbied against the proposal, and for the freedom to run trains with one worker. There is no set date by which the rule becomes effective or is rejected. Meanwhile, the nation's five major railroads are negotiating a new contract with the conductors and engineers, and are asking to be allowed to use one-man crews. Conductors would monitor trains remotely instead of climbing aboard. In a statement, BNSF, which handles the majority of the U.S. oil shipped by rail, said it was investing in conductors, not cutting them. "The current [contract] rules call for two-man crews so ensuring we are appropriately staffed to operate trains is vitally important," said Roxanne Butler, BNSF's director of media relations. Butler acknowledged the railroad's interest in a one-person crew contract. But she referred questions about why and whether the railroads have lobbied against the proposed federal requirement for two crew members to the Association of American Railroads (AAR), an industry group. Ed Greenberg, an AAR spokesperson, said that safety is the industry's number one concern, but there is no proof that two-person crews actually contribute to fewer accidents. "It is the AAR's position there is no data that justifies a regulatory requirement regarding crew size," he said in a statement to NBC News. After World War II there were seven people on almost every freight train, including four brakemen and a fireman. More recently, the major rail lines switched to two-person crews, like pilots in a cockpit. There's an engineer who drives the locomotive and a conductor who manages the long line of cars. 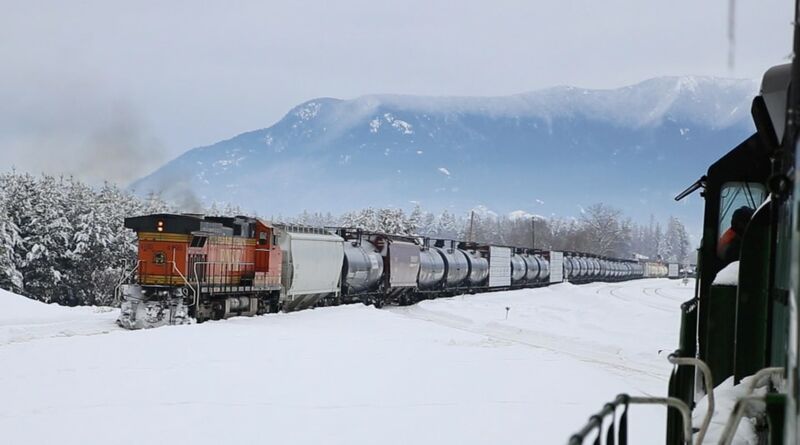 Last month NBC News got a first-hand look at what it's like to operate a modern freight train, spending two days with conductor trainees in Whitefish, Montana. The school was run by BNSF, which is right now leading the biggest investment in rail since the tracks were first laid: more than $25 billion industry wide, $15 billion from BNSF alone. The Whitefish depot is on the closest straight line between the Pacific Northwest and Chicago, and a few hundred miles from the booming Bakken oil region of North Dakota and Montana. Long, surprisingly silent oil and coal trains head west from Whitefish to refineries. "The first thing that we teach folks who want to be conductors is to have your head on a swivel," said Scott Murray, a third-generation conductor with nearly 40 years of experience. He rode in the rear locomotive, and, as the school's lead instructor, worked closely with the trainees. "You don't nick a finger around here — you lose a limb." Murray is shocked that railroads would consider cutting the conductor, the only mobile member of the crew. The engineer is required to stay in the cab. The conductor jumps down to open and close switches, attach and detach cars, and inspect cars for defects. "I tell you what," said Murray, his eyes wandering over every inch of a passing train, "in my 38 years, I've caught a lot of problems that would have been serious." But if BNSF and executives from the other major lines get their way, this conductor school in Whitefish, Montana could be seeing fewer recruits. "It's definitely coming," said a BNSF supervisor who requested anonymity in order to speak freely. "I'd rather see two people in the cab for safety purposes, but as time progresses, yes, we're definitely looking at a one-person crew." Workers are mystified by the idea that the crew could be cut down to a single worker. "It's just crazy," said Larry Sandefur, 56, a BNSF conductor with three decades of seniority. He spoke from the cab of a moving train, a short assemblage of lumber cars going southeast toward a factory in Columbia Falls, Montana. He held a clipboard with the weight of each car, what it was carrying and where it was going. He also tracked the mile markers and time, reconfirming the speed with the engineer and keeping an eye on the signals ahead. The tracks through Whitefish are typical of the tracks nationwide. Homes are common and close enough to see in windows. Road crossings come every 10 miles or so, logos clearly visible on every driver's coffee cup. The setting, on the other hand, is exceptional: the peaks of Glacier National Park, the water of Whitefish Lake. Rail workers say that one of the ways a conductor helps protect all this scenery is social. Conductors and engineers never know when they're going to get called in for another 12-hour hitch. As a result, many say they struggle with sleep, relying on each other to stay awake and focused. "There's times when, you know, the engineer comes to work and he needs you to talk to him and lean on his console the whole way over the road," said Murray. "We keep each other alert and the trains running safe." Murray denies playing up the dangers in an effort to strengthen the union's negotiating position. "Sure, we want our people out there," he said. "But so do you, if we're running through your town. This is bigger than us, bigger than the unions." Greenberg of the AAR argued that positive train control, the Congressionally mandated braking system known as PTC, could replace the conductor, providing the "redundancy" that regulators want on freight trains. But critics of PTC argue that the system is too failure-prone to replace conductors. The technology depends on a combination of GPS and cellular networks, purchased from different manufacturers and installed by the railroads. According to the author Dan Baum, who recently investigated PTC for Popular Science, the global positioning technology doesn't work in tunnels or canyons and the cellular back-up would be prone to dropped signals just the same as a smart phone on a hiking trip. Human factors cause more than a third of all rail accidents, he concluded. The rest are technical failures, of which PTC would be just another variable in a chain of potential failures. The system would also do nothing to prevent 98 percent of train accidents, including the collisions at road crossings that cause the most deaths. "Imagine a railcar full of chlorine bursting on the CSX tracks less than mile away from a big public event on the Capitol Mall in Washington, D.C. — an inauguration, say, or a concert," he wrote. "The resulting cloud could kill 100,000 people. Al Qaeda might do it, but it's more likely that a $55,000-a-year engineer, in the tenth hour of his shift, would simply nod off at the controls." So why would the railroads want the conductor to go the same way as the caboose? Greenberg, the industry spokesperson, said "safety has and always will be a priority for the freight rail industry." Critics point less charitably to money. PTC will cost the industry an estimated $10 billion to install, and another $850,000 a year to maintain. If it replaced conductors, however, that loss could become a net gain. "It's a phony issue for the railroads," said Larry Mann, the principal author of the landmark Federal Railroad Safety Act of 1970 and a member of the FRA's new working group on crew size. "The railroads are not interested in the safety aspect. They're interested in the dollars." BNSF declined to answer questions about PTC as a replacement for conductors.